If the signups for private insurance coverage through the health insurance exchange is any indicator, then more people than expected are signing up for insurance coverage. This is due to the deadline at the end of March, after which people will face a penalty. North Carolina is among the highest when it comes to health insurance signups, with over 200,000 people having signed up by the first of March. That’s impressive, given that it’s estimated that 391,000 are eligible for enrollment in a marketplace plan. These figures have gone past the estimated figures from last September, where they estimated that only 153,000 would sign up by the end of February, and 191,000 would have coverage by the deadline at the end of March. A majority of the insurance policies that were sold were purchased by people who were 45 years old and older, while it’s estimated that one in four North Carolina policies were sold to people who were 34 year old and below. It should be noted that while many had reservations about acquiring insurance coverage under what is now termed as “Obamacare,” this hasn’t stopped them from making sure they have insurance under the current structure. Younger policyholders, in particular, are important, as they usually pay more into the insurance system than they use up. That helps offset the healthcare costs of older policyholders. Health insurance plays a big role if a policyholder is involved in a personal injury case. And because of that, it’s important to make sure that your health claims are properly used. 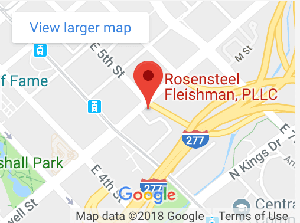 This is where lawyers like those from Rosensteel Fleishman, PLLC come in, as they can help you with personal injury cases where you insurance can be affected. After all that you’ve paid, it’s a good idea to make sure that you can maximize your insurance benefits. •	There will be no fee for a consultation with one of our lawyers to find out if you have a case. •	All communications with clients will be replied to, via phone calls, letters, or e-mails. •	All clients will be treated with the proper dignity and respect befitting their age. •	The client’s wishes will be observed as best as possible, and the lawyers assigned will make sure that the best result will be the actual outcome. It doesn’t matter if it’s an arbitration, a jury trial, or a settlement, the lawyers will make sure that the client is fully informed and in control during the entire process. One of the more confusion aspects of the new law deals with medical malpractice. Health insurance companies are actively looking into claims for medical malpractice. If evidence is found some carriers are refusing to pay claims for follow up treatment arguing instead this should be paid for by the at fault provider. This becomes complicated to say the least and may result in the victim being caught in the middle. This is because health insurance is supposed to help you with your bills, and medical malpractice can simply neutralize that situation, aside from adding more uninsured costs to your resource burdens. Malpractice is defined in North Carolina as a breach of the standard care required by a medical professional during the course of treatment. A medical mistake can be potentially be life-threatening. Medical malpractice carriers are typically very different from the more common insurance carriers (auto and home). Further, the laws are much more complex. The lawyers of Rosensteel Fleishman can explain the laws in a way that makes sense. We can break down the complexities of the law and explain your rights. Malpractice suits are emotionally and physically draining situations. Our lawyers will see to it that the process will be as efficient as possible while striving for the best possible result as the goal. It’s frighteningly easy to be injured while on the job, and even if you have insurance coverage, your first internal question will be: “How can I pay for my bills if I’m the one who is hurt?” If you’re the breadwinner, even if your medical bills are covered by insurance, you have to make sure that your other costs are covered as well. That’s where cases for worker’s compensation come in. The basic rule is that if you are injured while on the job, your employer should take care of your medical treatment. In addition, your employer may have to pay you two-thirds of your weekly wage while you are unable to work. However, with many factors affecting how much you are actually owed, it’s a good idea to contact lawyers, like those from Rosensteel Fleishman, to iron out all the bugs and make sure you can recover fully without having to worry about your own family. The subject of wrongful death isn’t one that people want to talk about, but if the worst has happened, then a loved one has passed away because of a car accident, malpractice, or other similarly unfortunate event. And even though life insurance payouts can help the family, there are still many expenses to take care of. This is where lawyers from Rosensteel and Fleishman come in, by making sure that the situation is neatly resolved, with the least amount of stress for the family. If you or a loved one is injured in an accident and are facing questions regarding insurance please contact us to discuss your case.